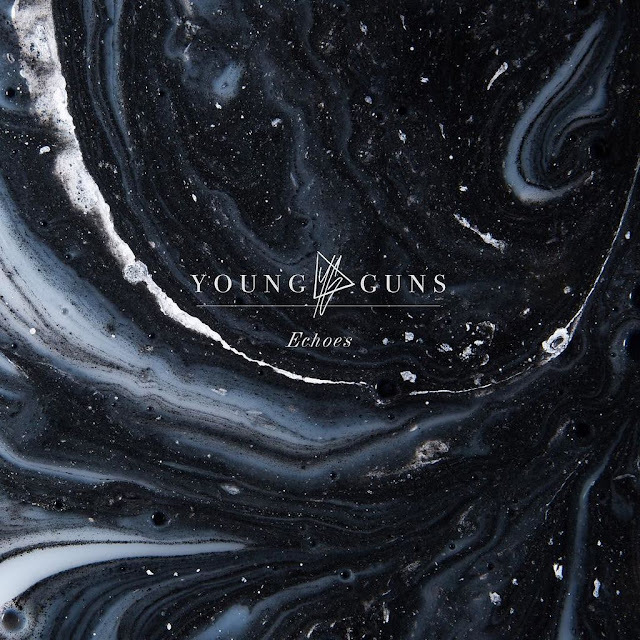 It's been less than 18 months since Young Guns's last release, 'Ones and Zeros', but they're back again already, with their fourth studio album, 'Echoes'. The band have been around the British modern rock scene for a good few years now, but their last album didn't make a huge splash. 'Echoes' just might though, as they've moved away from the pop influence and heavy synthesisers found on 'Ones and Zeros', and stepped back into more instrumental, riff-heavy, traditional rock music. The synthesisers aren't gone entirely, such as on 'Buried', where they pulse away in the background, but overall this record feels heavier and more grounded than the spacey atmosphere of their last release. The record careens forwards with each track, slowing in tempo at moments, but overall keeping up a momentum and an energy throughout. Their sound feels bigger too, more full and fleshed out, with catchy guitar riffs and booming bass lines, and memorable, powerful vocal melodies, poured out in Gustav Wood's distinct, rich timbre, with emotive, reflective lyrics throughout the record. The album is soaring and sweeping, striving for those big, stadium-ready anthemic rock songs, and achieving it in many of them. 'Bulletproof' and 'Mad World' are standouts, being the previously released singles, with their catchy hooks, but this is a record full of other potential singles, with 'Mercury in Retrograde', 'Living In a Dream Is so Easy', and title track 'Echoes' all being memorable. Previous records from the band have had many slower tracks, often with a haunting tone to them, which can be found here again in 'Paradise', but this time the eerie synthesiser sounds, while still present, have been stripped back to a basic piano accompaniment, serving to showcase Wood's vocals even further. Another slower tempo track is 'Awakening', but it has a much fuller sound, with a big, soaring chorus, to fill out a room, or even a stadium. Most of the record is full-on, bursting with racing guitars and pounding drums. There are moments when it lulls, or when tracks begin to sound a little similar, but so far I'm finding it to be an album that grows on you, and the nuances between tracks become clearer on each subsequent listen. Where 'Ones and Zeros' was experimental and vibrant, 'Echoes' feels like where Young Guns are truly at home. Soaring melodies, meaningful lyrics, backed with heavy, catchy riffs, and returning the emphasis to instrumental music. It's not as experimental as their last album, but this time they feel like they're being themselves, crafting the songs that they really want to make, and are confident and comfortable in their sound. And hopefully in doing so, they can cement their place in the modern rock scene even more firmly.